One of my highlights this week was attending a talk I’d been waiting to see for a very long time – Ghost Signs by Sam Roberts, at the gorgeous St Bride Library. I just wanted to share some of the really interesting things I learned and beautiful old signs I saw. I have a bit of a fetish for those faded old advertising signs, snapshots of what has gone before and are still clinging on to life. These signs have been around for so long, some have faded into illegibility. They are both ghost signs in their half-present appearance, and literal representations of ghosts by advertising what is no longer around. Sam has been curating a global catalogue of ‘ghost signs’ since 2007, using his own photographs and those submitted by others. He started the evening with the sign that started it all for him; Walker Bros. and Waterman’s Ideal, both fountain pen specialists, on Stoke Newington Church Street, London (although he now notes his true first sign is an earlier one from Nicaragua). This is advertising a place that repairs fountain pens. Imagine that. A time when you could actually get someone to fix your fountain pen. This is real bygone stuff. He then went on to describe the interesting techniques employed to get these huge signs painted up on to the side of buildings at high level in the first place. This included drawing the original small, scaling it up onto a wall using the ‘pounce’ technique, then painting it in. Another was an embossed style non-painted version whereby the lettering was impressed into the wall render. Some of the most common themes that popped up were blitz advertising, such as by Gillette, Bovril, and Hovis; if you pay attention to ghost signs yourself, you may have noticed just how many there are around for these brands. Another theme was the abundance of mascots (such as Puck Matches) and manicules (well-known hand pointing a finger). Even early transport signage, some of which is a little haphazard and crazy. 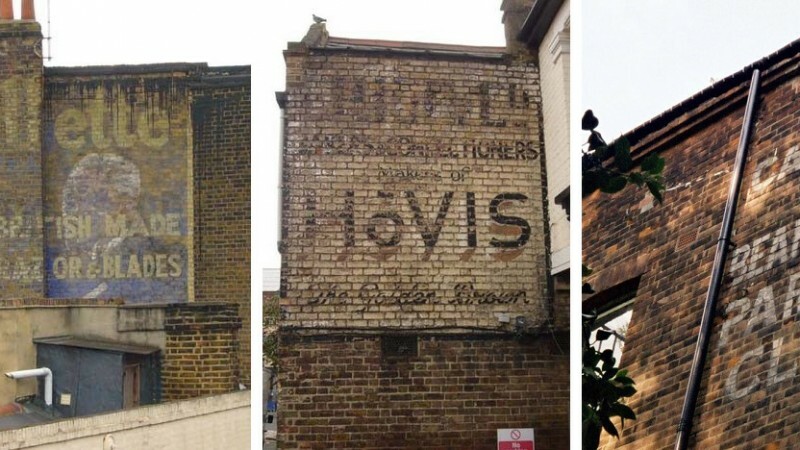 Even though many ghost signs have survived, there is a real worry about their impermanence, predominantly through weathering, but also from man’s interference; either through painting over them or through building development that’s so prevalent these days, an example being one that has sadly been painted over in Clapham. I think ghost signs add depth and character to the buildings, heaven knows why someone would want to remove them. Another interesting and fortuitous story was about a ghost sign in Grant Street, London, that had been whitewashed over, but upon removing the whitewash it revealed another older ghost sign underneath the first! An important point put across was that of the duality of billboards; although they are often erected on top of ghost signs, hiding them from existence, they also ironically protect them at the same time, preventing them from being exposed to the elements. That was something that hadn’t crossed my mind before, and so in a weird way I no longer mind billboards to the same degree. There is trend these days to restore and repaint ghost signs to bring them back looking as good as new, which seems to me to be a bit of an oxymoron; after all, isn’t their beauty just how they appear now, mere traces of what has gone before? And in my eyes, they just look plain ugly after restoration, losing all their subtlety and class. Even funnier is a trend today to create brand new wall-painted signs, such as one for Jack Daniels which is painted on a wall (well, stencilled actually), but gives its young age away with the addition in small writing at the bottom to ‘drink responsibly’. Further, there was recently an advert for Anchor butter as if it were painted on a wall, but it was actually a billboard. Sam Roberts introducing Peterkin’s Custard in the Top 10, plus my own photo of it from my baby ghost sign archive! Sam finished with his top 10 ghost signs from across the world. Here I was very excited and proud to see one that is only 5 minutes walk from where I live! The lovely and vibrant Peterkin’s Custard. I just hope that all these ghost signs remain around the world, telling their own little stories to their local inhabitants. What I found most interesting overall is the way in which ghost signs reflect social change. For example, how smoking was actually once considered to be good for you, and changes in language (try googling ‘beanfeast’). And of course how our normal daily life was once so different, our main access to music was pianos rather than recorded music (there are many piano sale and restoration ghost signs), and indeed returning to the fact that we once bothered to repair our fountain pens. Sam’s talk definitely left me with a lot of food for thought and It’s inspired me to continue to add to my own photo collection of ghost signs. And although I already really loved them, I managed to fall in love with ghost signs even more. They are ever present and comforting in our modern life even if we don’t notice them. They are old friends. Thanks to Sam Roberts for allowing me to post some of his photos. And apologies from me for my very poor quality ones!